Say it with a Sock vs. Woven Pear: best subscription socks for women? 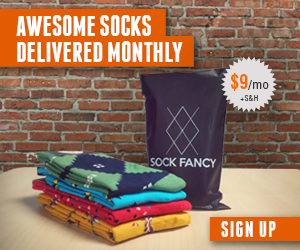 We’ve discussed sock of the month club subscriptions as a great option for gifts for friends, family, and colleagues. Sock clubs are also a boost to your own personal style, since socks are a clear way to add more flash to your outfit, especially if you are wearing dull shirt colors. With the boom in eCommerce, buying socks online has never been more convenient or easy, and the emerging subscription trends have solved the basic problem of needing a fresh set of socks on a regular basis. Two of our favorite sock of the month clubs are Say it with a Sock and Woven Pear. Woven Pear is a sock site that offers a sock subscription for women — so today, we’ll compare the two sock of the month club services for women. Woven Pear sends you a new set of socks each month, but each month is a surprise Comparatively, Say it with a Sock gives you the choice of receiving 1 pair, 2 pair, or 3 pairs of socks each month in your package. Woven Pear gives you several payment options. You can subscribe monthly for $24.99 per month, prepay for 6 months for $132.90, or prepay for 12 months for $239.90. Say it with a Sock prices start at $11.99 per month for 1 pair of socks, and then it’s $8 to add a second pair or $14 to add two more pairs each month. With Say it with a Sock, you can pay in advance to save money. Woven Pear and Say it with a Sock are positively reviewed by their subscription base. The Say it with a Sock website posts reviews, and as of today they are showing 696 reviews and an average rating of 4.5 out of 5 stars. Woven Pear also has reviews on their website, powered by Shopify review app Yotpo. Woven Pear receives 5 out of 5 starts on 680 reviews as of this writing. What’s your favorite sock subscription for women? Let us know in the comments if you have tried Say it with a Sock or Woven Pear, and which one you prefer! Previous Article Foot Cardigan vs. Ozone Socks: The best sock subscription? Next Article Foot Cardigan vs Woven Pear: best sock club for women’s socks?